When we moved into our house five years ago I didn’t think I’d end up painting the master bedroom walls an average of once a year! From sage, to pumpkin, then tan with white vertical stripes on one wall (Jon would say definitely losing some square footage) I finally settled for pure white. People thought I was crazy ‘cause color was always my thing. I totally love it ….so far! The frame on nightstand I bought for a couple of dollars and painted it the blue-green color. I then painted some scripture on the side and bottom using carbon paper to transfer onto the frame. The nightstand was formerly a sewing machine cabinet. I used a hammer to knock out the sides ( I made sure no one was around at the time-it sounded pretty bad ) I removed the doors and painted the stand an off white ( mixed my own paint-white with a few drops of brown ) I then distressed it using sandpaper and wiped an oil-based dark brown stain into the cracks. The other little nightstand is an old plant stand that I painted white. The lamp I got for 50 cents at a local thrift store. ( my favorite shopping spot! )I spray painted it white. First I took the seat off and then painted the chair white. I lightly sanded the wood just to get the surface a little dull before applying paint. After it was dry I mixed some dark brown paint with a few drops of paint conditioner and rubbed over the chair making sure to cover all the grooves & cracks. When that was dry, I added the word “believe,” again using carbon paper. I covered the seat with a blue & white fabric I had laying around here. The lady that had a look of pity on her face when I bought the chair should see it now! The sign hanging above the headboard I hand painted also using carbon paper to transfer. Our bed I also made spending nearly nothing! 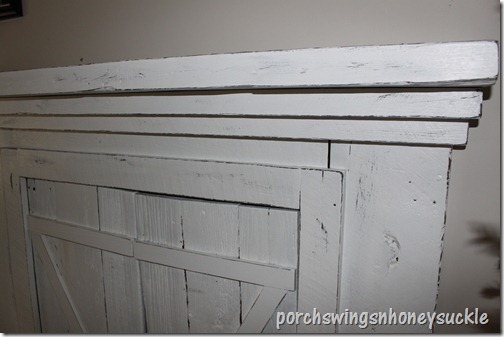 The headboard is an old door that I just added a header to. We bought a king-sized metal bed frame for 40 dollars and attached the headboard to it ( that was a little more complicated ) I then found some treated 2x12s in the shop, much to Jon’s dismay. ( treated wood is generally used outdoors ) I was desperate! I painted those white too and attached them to the metal frame. The bench was something that my dad made years ago before I was married. I remember it being in the barn for years. I guess it’s something that came with the home place when we bought it. The last couple of years I had it beside my water garden in the backyard. I painted it white and retired it to the bedroom.